Final Fantasy games have always had plotlines and concepts that sound like gibberish (fal'Cie and l'Cie, anyone? 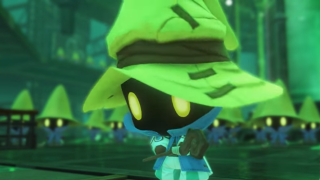 ), but I think the upcoming World of Final Fantasy might have them all beat. First of all, we've got some serious chibi-fication going on with our heroes, a world called Grimoire, and then there's talk of "mirages," and keep in mind this is a game where you stack Tonberrys (Tonberries? Tonberri?) on your head. It's actually not that complex when you break it down; our heroes are siblings who travel to a magical world which combines aspects of Final Fantasy history, where everything is tiny and/or adorable. You stack things on your head to change your attacks and abilities. It's only when you combine these things, start giving them names, and talk in melodramatic prose about prophecies that it all becomes a confusing jumble of proper nouns and gobbledegook. At least we won't have to wait too long to decipher this strange take on the… erm, world of Final Fantasy. World of Final Fantasy will be available for PS4 and PS Vita on October 25, 2016.